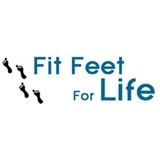 Fit Feet For Life (St Petersburg) - Book Appointment Online! Quick and effective treatment of YOUR FOOT and ANKLE problem with a GENTLE TOUCH. At Fit Feet For Life our doctors and staff provide medical treatment of foot and ankle disorders to patients of all ages in the Tampa Bay Area with 5 locations for your convenience. We are committed to solving your foot and ankle problems quickly and effectively with a gentle touch. We look forward to meeting you. Please schedule an appointment so we can help you.